Doctor Who: The “Other” Doctors – The Two Faces of John Smith | Warped Factor - Words in the Key of Geek. Tony tries being human for a day. Is not sure it’ll catch on. 21st century Doctor Who has borrowed extensively from both Classic Who and Who in other media – Rise of the Cybermen and the Age of Steel owed at least something, though perhaps not a great deal, to the Big Finish story Spare Parts. Dalek likewise had its origins in Big Finish story Jubilee. Only one story can claim to have been translated almost directly though – Human Nature/The Family of Blood took Paul Cornell’s Seventh Doctor novel, also called Human Nature, and used it to explore an adventure the Doctor had never been allowed to have, an idea that would have seemed impossible and almost insane before it was written and done. What if the Doctor, for some reason, became fully human? What if he forgot who he was, and became entirely embroiled in the mindsets and affairs of one place, one time, one species? What if the Doctor fell in love? And what if the universe wouldn’t let him, wouldn’t leave him alone to be this small-scale, involved, happy person, but came after him for the Time Lord he used to be? The more you think about the issues raised by Cornell’s idea, the more appealing it gets to see what would happen, at least once, were such a thing to happen. It’s perhaps a little unfortunate (from the Doctor’s point of view, rather than the reader’s or viewer’s) that the time and the place he chooses to do it, in both the original book and the TV version, which updated the idea for the Tenth Doctor and Martha, is the build-up to the First World War, in England, where the mindset had become almost atrophied in the greatness of Britain and the rightness of the British Empire, as though such colonial power was God’s will, the British some beneficial species of overlord though commerce and conquest. The ensuing carnage would shake Britain’s certainties forever, but in the years before the war, the atmosphere in Britain was generally that God was in his Heaven and Britannia ruled the waves. Enter the Doctor, or more precisely, enter Doctor John Smith, tutor at a privileged, rural private school for boys. While there are some fairly big differences between the book and the TV version, especially as regards the nature of the alien threat, perhaps the most interesting differences are in the nature of the two John Smiths – the two ‘human Doctors’ – and most particularly the reasons they go through the human experiment at all. McCoy’s Seventh Doctor had begun (and indeed to some extent had been cast) in a spirit of levity – hence the pratfalls, spoon-playing, fractured and splinted proverbs. Perversely when we look back, the idea of the Seventh Doctor was originally to lighten the tone after the Sixth Doctor’s darker, more violent plotlines and character choices. McCoy and Script Editor Andrew Cartmel were having none of that though, and the diminutive Doctor with the umbrella soon turned broody and dark himself, becoming a righter of wrongs on a far grander scale than most of his predecessors, going up against ‘Elder Gods’ like Fenric, left, right and centre, finally destroying the Daleks and the Cybermen (as far as we knew) and generally settling the scores of generations of ingenuity that had still left the job unfinished. Travelling with Bernice Summerfield, the Seventh Doctor finds himself unable to understand Bennie’s human, personal grief at the death of Guy de Carnac, so he actively acquires the technology that will let him experience that human emotion, that will key him in to the way the little people of the universe are not only allowed but compelled to feel. His career in his seventh incarnation has taken him further and further away from the ability to feel the little things of the time-bound, the loves, the griefs, the things they have time to let matter. So when the Seventh Doctor becomes Doctor John Smith, he does it both to reconnect with that sense of frailty and passion, and, as he says later in the book, because he’s grown a little sick of being him, of being Time’s Champion and of always flying away and feeling nothing that’s vital, everything in abstract. Doctor John Smith, in the Seventh Doctor’s version, is the man who’s become ‘so much more than another Time Lord’ both giving up and trying to recapture the things with which he began. What then of the later, Tennant version of Doctor John Smith? The story is broadly the same – Tennant expands the ease with which Smith assimilates, adds a degree of initial willingness to teach the boys the laws and practice of combat, and while he’s certainly the least at ease with life and conversation that the Tennant Doctor was ever to become, he still finds it significantly more straightforward to woo Nurse Redfern than the McCoy version did. The Tenth Doctor’s version of John Smith was telling though – in a probably unconscious foreshadowing of the Doctor’s own explosion of selfishness when his fate looks sealed and he knows he will have to embrace the death of regeneration, the Tenth John Smith demands to be taken account of: ‘What about me? Don’t I matter? Doesn’t what I want count for anything? Am I just a lie that this other man created, to be discarded when it suits him?’ He brings the fundamental questions that Cornell asks front and centre. There’s a philosophical experiment that says werewolves could not logically exist, because humans have free will, so they could choose to become a wolf, but wolves don’t have free will, they have instinct, so they’d never change back. In a way, the Tennant John Smith is that wolf – he’s found things in the human experience that mean the whole world to him, and he’s prepared to fight, to demand, to ask those awkward questions if it means he gets to keep them, to stay John Smith into a future that includes love, marriage, children, grandchildren and the thousand ‘slow-path’ joys and pains of growing old with the love of someone else. And when it comes down to it, why did the Tenth Doctor engage the ‘handily there all along’ technology to turn him into a human? Not because he’d had enough of being himself, not by any means – but seemingly because he was trying to be kind. By running away, he wasn’t trying to teach himself any lessons, he was trying to avoid unleashing his fighting wrath on the Family of Blood. When faced with Daleks, Cybermen, Sontarans, he’s so conditioned to fighting, to thwarting their plans he never thinks twice, but with the Family, he doesn’t want to be cruel, but kind. He wants them to ignore him, so he doesn’t have to sort them out, to bring the anger of the Time Lord to bear on them. Just go away is his fundamental plea – I’ve been doing this so long, I need someone to stop me acting on my first instincts, and for once, with you, that person will be me. Where the Seventh Doctor becomes John Smith to re-learn individual compassion and grief, to re-connect to a human level of emotional impact, the Tenth Doctor does it because he’s scared of becoming like the Seventh, of becoming in a sense the Time Lord Victorious. 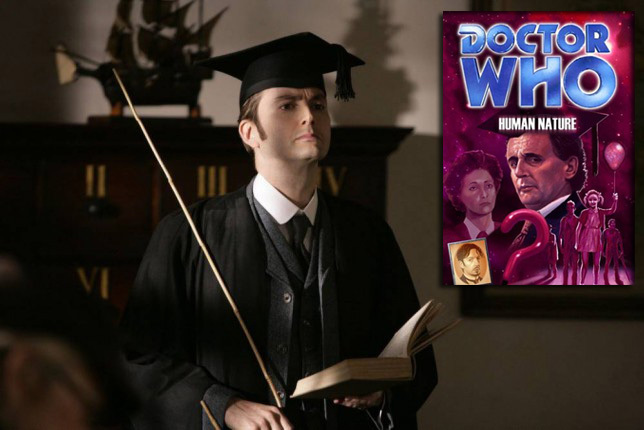 There are a lot of differences between the book and the TV version of Human Nature, but in either version, Doctor John Smith, teacher and human, is one of the more interesting ‘other’ Doctors there have been, because Smith takes the burden of the hero off the Doctor’s shoulders, and forces him to navigate a world that will soon be toppling into chaos and flames with only the emotional and intellectual resources of any other human. Through him we learn some of the most important things about being a human: the search for consequence and connection with others, and the agonising pain when those connections must be given up.